Missives from a Misanthropologist: Holy Crap - I'm Listed! I just found out that this blog is listed as one of the "Top 50 Blogs for Anthropologists" - number 50, in fact. I have to admit that this comes as something of a shock. So much so that my face was flushed and I was maybe a little light-headed when I found out. That means that someone out there actually reads what I'm writing. So, in light of my newfound popularity, I promise to make an effort to think about what I say before I post it. I'll try to stick to more anthropologically relevant subjects. I may even post the occasional retraction. Oh, who am I kidding? This blog is pure catharsis for me. 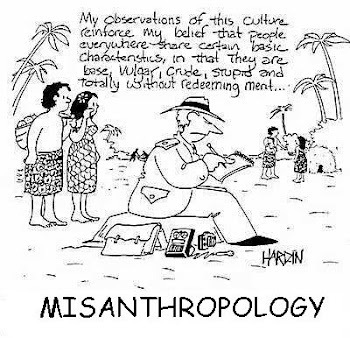 It may make me a piss-poor anthropologist, but people annoy me. Life annoys me. It can be absurd and pointless, but we keep on keepin' on and this blog helps me do that; hopefully without hurting anyone in the process. So, thanks to those of you that read my incoherent ramblings. I mean that - no sarcasm or anything. And now that I know someone is paying attention, I'll try to post a bit more regularly. It's just that sometimes people annoy so much that, at the end of the day, all I can do is rock back and forth in the fetal position for an extended period of time. You better step up your game, you're barely hanging on the list at number 50. You are my new hero! I found your blog looking for famous anthropologists, and your post about the same was one of the top 3 google results (I was looking for something to put on a Valentine's card for my wife, the anthropologist). I feel as if you've been rooting around in my head for some of these rants. Well done, sir! Wow! Thanks, Quetzal. I always appreciate having my ego pumped up by my adoring public!